The Wellcome Collection is hosting an exhibition entitled Thinking with the body: mind and movement in the work of Wayne McGregor | Random Dance. The installation uses dance, specially commissioned film, music, artwork, technology and science to explore creativity in dance. Thinking with the body asks how thought, emotion, sensation and action combine to aid learning, creation or communication with others. The exhibition invites visitors to think about how mind, body and movement interact in each of us, whether we dance or not. Wayne McGregor CBE is an award-winning British choreographer well known for his physically demanding choreography as well as a unique range of collaborative projects involving dance, design, film, music, science, technology and visual art. He is Artistic Director of Wayne McGregor | Random Dance, founded in 1992, the Resident Company at Sadler's Wells Theatre in London. He is also Resident Choreographer of The Royal Ballet (appointed 2006). McGregor is creator of new works for La Scala, Milan, Paris Opera Ballet, Nederlands Dans Theatre, Stuttgart Ballet and New York City Ballet, as well as director of movement for the film Harry Potter and the Goblet of Fire. Recent ventures have included large-scale public dance works such as Big Dance Trafalgar Square (to mark the 2012 Olympics), Borderlands, for San Francisco Ballet, and Raven Girl for The Royal Ballet. McGregor was honoured with a CBE (Commander of the Order of the British Empire) in 2011. The display begins by outlining McGregor's diverse interests, influences and artistic partners including composer John Taverner, artist Mark Wallinger and designers rAndom International. A timeline charts the development of ideas and concepts that have inspired Wayne McGregor | Random Dance over a 14-year period. The chart demonstrates how the dance-making process has been influenced by a number of collaborations with researchers and artists from a variety of disciplines including cognitive and social science. The aim of those collaborations was to explore all aspects of dance to gain a fresh understanding of choreographic techniques and to utilise results of that research in McGregor's new ballet Atomos, making its first appearance at Sadlers Wells in October 2013. 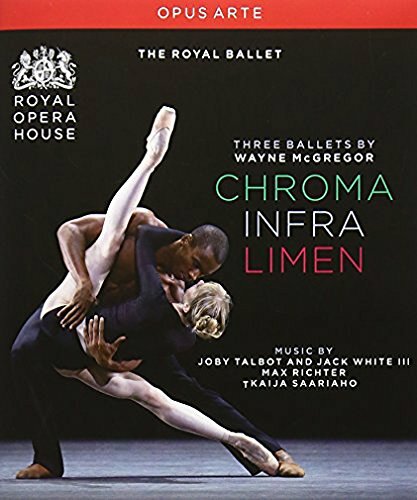 The timeline lists most Wayne McGregor | Random Dance productions together with some Royal Ballet and European and American productions which have been influenced by McGregor's research. Specifically, the timeline highlights the close interconnections between choreography, language and annotation. The chart also presents an analysis of the progress made by the research and digital media development projects. In this immersive exhibition visitors can take part in one-to-one exercises encouraging us to investigate twelve choreographic principles to reveal the complicated interconnections between the imagination and the creation of movement. The results of one particular collaboration, Physical Thinking, between Wayne McGregor and cognitive scientist David Kirsh, are relayed through a montage of projected film footage and images devised by David Kirsh and film-maker David Bickerstaff. The installation features a fascinating series of interviews and rehearsal footage demonstrating the silent communication that occurs continuously between dancers and choreographer. Kirsh investigates the relationship between knowledge, memory and environment and their influence on dancers and dance-making. Another key exhibit is Becoming. For many years McGregor has been interested in the development of interactive choreographic software combining artificial intelligence and choreographic thinking tools. Becoming, specially developed for Atomos, is the latest version of the software – an additional dancer, a human-sized 3D animation, is displayed on a large screen reacting and supporting dancers in the studio. The resulting digital art work can be viewed through 3D glasses. It is continously fed with external stimuli and is constantly changing. The display also includes an immersive sound installation by composer Ben Frost entitled Seeing Sound. Frost has created a new soundtrack based on his original score for the Wayne-McGregor | Random Dance production FAR (2010). It's a strange installation comprising a large, darkened room. You enter the room and at at a table to listen to the soundtrack. There are absolutely no distractions. The experience is intense, the mind clears, and we really hear the sounds allowing us to draw on what we have already seen in the exhibition and to consider the new images inspired by the aural stimuli. Seeing Sound is followed by film footage of the making of Atomos, shot by David Bickerstaff over a three-day period.The film provides a unique glimpse into the rehearsal studio. Speaking about the development of new dance works, McGregor said: ″Being in the studio working with bodies is the time when I'm happiest. I don't know what is going to come out. All I can do is go down a certain number of directions, and experiment with things.″ Bickerstaff's film shows the complex range of decisions involved in the dance-making process. Thinking with the body: mind and movement in the work of Wayne McGregor | Random Dance is on show until 27th October 2013. The exhibition is free to enter and further information can be obtained from the Wellcome Collection.